The weekends have the ability to make or break your weight loss and health efforts. One bad weekend could keep you from losing those pounds you worked so hard to lose during the week! Of course, making better choices all week long is the best option, but for many, that’s not realistic. This low carb recipe, can help you get a jump start on the week by helping you balance out some of the unhealthy meals you had over the weekend. 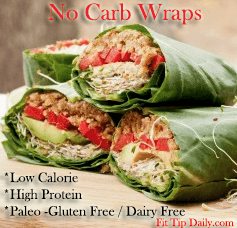 No carb wraps are gluten free, dairy free, and low calorie. Fitness Tips – Swiss chard, like spinach, is dense in vitamin A, C, K, folate, potassium, iron and fiber. It’s considered a super food for its anti cancer qualities also. Hate chard? 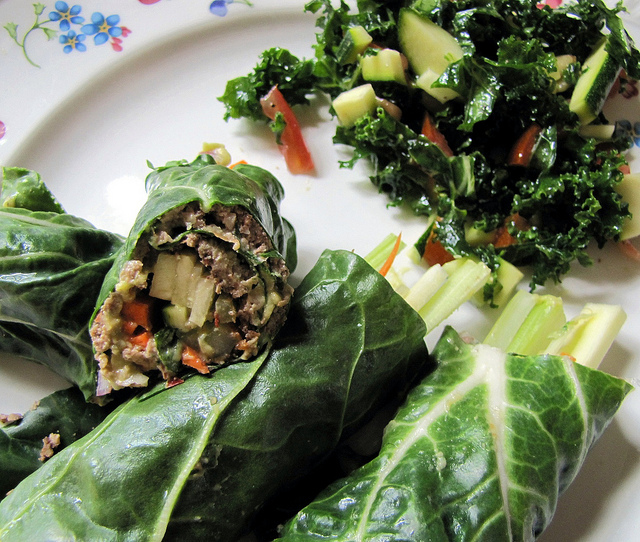 That’s ok, you can use Large romaine leaves, collard greens, or kale leaves. 1/2 small can of albacore tuna or any other meat choice. Stack the thinly sliced cucumber on top followed by tomato. Feel free to add additional veggies. Next fold the bottom of the leaf in first, then roll your leave up. You can use a tooth pick to hold the leaves in place until you eat. Fit Tips: If you love this love carb recipe, make extra. You’re already doing the work to make one so why not stuff 4 -5 more and place them in the fridge as snacks, or meals for the next day? Suzy, In order to help you further I might need to know what foods he does like :) We have some great recipes on our site under the "Eat it" tab also.